Post contributed by Mandy Cooper, Research Services Graduate Intern, and Ph.D. candidate, Duke University Department of History. I have to admit that I’ve never considered using rum to wash my hair! The smell alone would be overpowering. 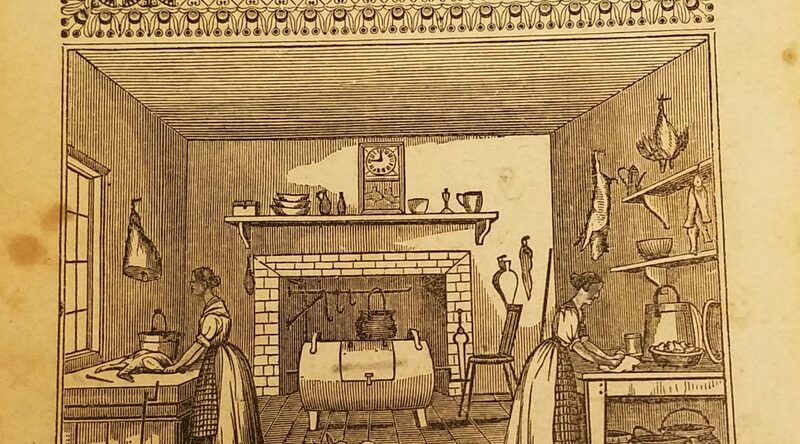 Prescriptive literature from the nineteenth century is filled with all kinds of advice for women—from keeping a home and raising children to cooking, healing, and beauty. Some of this advice is good, like Child’s tip to thoroughly clean your teeth after eating your last meal at night. On the other hand, some of the advice is bad. Still other kinds of advice—like washing your hair with New England rum—are just weird. My fellow intern and I joked that we should do a beauty advice post similar to the Test Kitchen posts, but neither of us were willing to be the test subjects—despite plenty of material to choose from! It was tempting to try the recipe for Cologne Water in The New England Economical Housekeeper that called for rosemary oil, lemon oil, lavender oil, cinnamon oil, and rose water, just to see what it would smell like. Though the author of The American Family Keepsake assured readers that a recipe for Turkish Rouge “is a superior rouge; […] will not rub off, and is in no ways injurious to the face,” it was less tempting to try this recipe, which called for alkanet chips to be suspended in alcohol until it reached the right color. 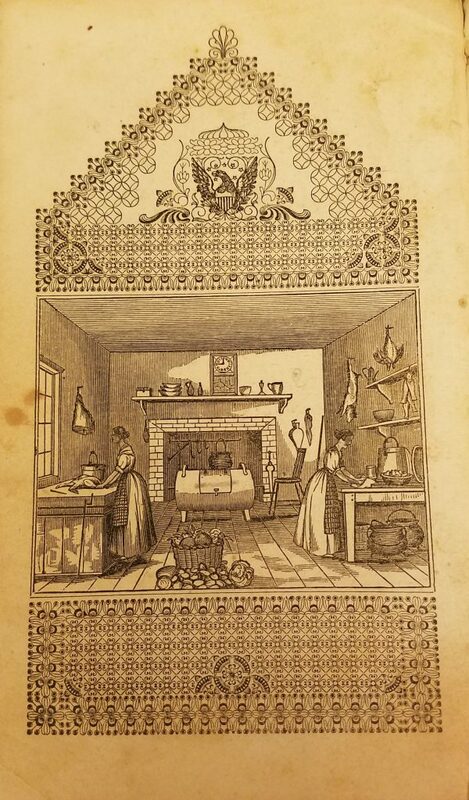 After reading through Child’s advice while searching for a recipe, I decided to look at other prescriptive literature from the nineteenth century and look at the different kinds of advice that women were given that shaped their lives, even though it didn’t always match reality. Different types of etiquette guides and domestic arts manuals have been around for centuries and are all examples of prescriptive literature. The Rubenstein’s guide to prescriptive literature includes material from 1631 to 2001 and highlights the changing focus of this literature. A lot of the advice aimed at married women centered around being a good mother, wife, and hostess—and doing so economically while keeping up appearances. Child’s The American Frugal Housewife, The New England Economical Housekeeper, The Frugal Housewife, and The Female Economist are all good examples of this type of prescriptive literature. Instructions for being frugal were usually accompanied with tips for treating illnesses, raising children, and taking care of the household. Like a lot of advice manuals today, a lot of this advice presented a picture of an ideal woman that was a good housewife, a mother who trained her children well, a good cook, and an excellent hostess. For example, in Mrs. William Parkes’s Domestic Duties; Instructions to young married ladies, she informed her readers that “To possess the skill of a connoisseur in deciding upon the various flavours of wines, their strength and body, is not desirable for a female.” Obviously, knowledge of wine was only suitable as a male area of expertise. 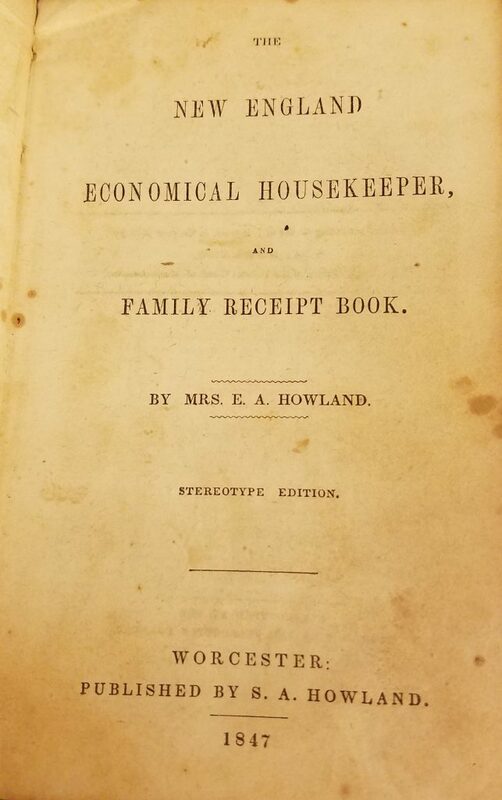 Frontispiece of The New England Economical Housekeeper. Alright. Let’s get down to the good, the bad, and the just plain weird of all of this advice. I’ll try to resist the temptation to just list all of the weird advice for the shock value alone and stick to one or two examples of each—though it’s a difficult task! 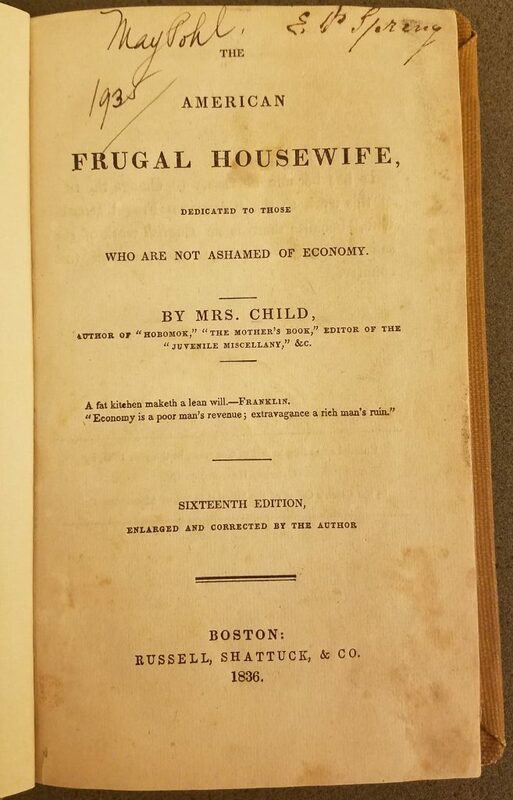 Child’s American Frugal Housewife was filled with good advice for women who wanted (or needed) to run a household on a budget. For example, she had two instructions for women to save money on paper “Preserve the backs of old letters to write upon” and “buy coarse white paper by the quantity” to make books for children learning to write. Mrs. Smith’s The Female Economist also contains advice for cleaning teeth; she provides instructions for creating a tooth powder: “Beat fine and sift two ounces of charcoal; mix with it one ounce of powder of bark.” Although this seems weird, given the charcoal toothpaste I’ve seen in stores and advertised online lately it’s not necessarily the worst advice. Now for the bad advice. Mrs. Smith’s The Female Economist has a recipe for a healing ointment: an “Ointment of Lead.” Yes, you read that right. Mrs. Smith says to “Take of olive-oil half a pint; white wax, two ounces; sugar of lead, three drachms. Let the sugar of lead (reduced into a fine powder) be rubbed up with some part of the oil, and afterwards added to the other ingredients, previously melted together; stir them continually till quite cold.” She continued, “This cooling and gently astringent ointment may be used in all cases where the intention is to dry and skin over the wound, as in scalding, &c.” Mrs. Smith also had a recipe for “Eye-Water” to bathe the eyes in that called for sugar of lead. Unless you want to end up like the Mad Hatter in Alice in Wonderland, this is definitely not advice you want to follow—especially for use on an open wound! And now for the advice that is just plain weird. Two of the books I looked at had similar remedies for a sore throat. Child’s advice was to bind a stocking on “warm from the foot, at night” while Mrs. Smith said to “Wear a worsted stocking round the throat all night which has been worn on the leg during the day.” I don’t know about you, but I don’t think I want to try this sore throat remedy. Rum wasn’t the only alcohol that was suggested for washing hair. Mrs. L.G. Abell’s The Skillful Housewife’s Book suggested wetting the hair “in brandy occasionally to strengthen the roots.” Actually, alcohol is a common ingredient in advice that seems weird to modern eyes. Mrs. Abell also suggested using brandy instead of water when making ink to prevent the ink from freezing. While it’s tempting to keep going, I’ll stop here with just a sampling of the advice in nineteenth-century prescriptive literature. But, that doesn’t mean that you have to stop! Come in and take a look at some of the prescriptive literature in our collections—we’d love to have you! And of course, you can always take a look at some of the fully digitized versions of these books available online through HathiTrust. Have You Driven a Ford Advertisement Lately? I can think of better uses for rum and brandy, although not in sufficient quantities to make me think putting lead on my open wounds is a good idea.